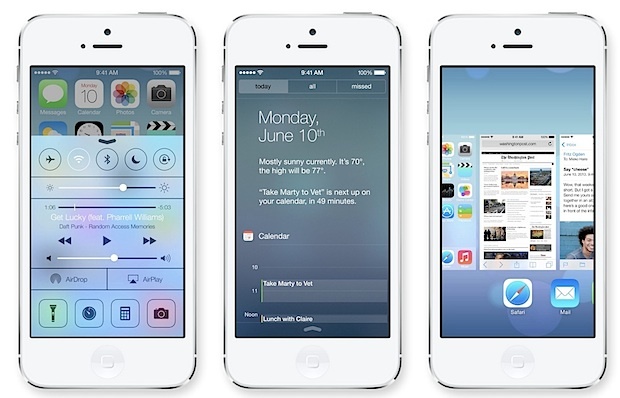 iOS 7 will be available to the public on September 18, according to Apple. The release date was announced today at Apple’s iPhone event held at their Cupertino campus. The update will be available through an OTA Software Update on all compatible devices, and also accessible from iTunes and ISPW as usual. Supported hardware for iOS 7 includes iPhone 4, iPhone 4S, iPhone 5, iPad 2, iPad 3, iPad 4, iPad mini, and the iPod touch 4th and 5th gen. Of course, the new iPhone 5C and 5S models will also support iOS 7 and will ship with the redesigned OS preinstalled. iOS 7 is a free update offering many new features, along with a significant user interface overhaul to Apple’s mobile experience. Additionally, iWork and iLife apps will become free and be available along with the iOS 7 release, which includes apps like Keynote, Pages, Numbers, iMovie, and iPhoto. As usual, users are advised to back up their devices before updating to any new version.